What is the 10 Miles Per Hour Challenge? This is an opportunity to bike a mile (or more) in someone else’s shoes. To truly appreciate what the current experience is like for every cyclist we can start with a baseline of about 10 miles per hour, a speed which most people out there can attain, regardless of ability. As such, if riding a bicycle on various routes at 10 mph is significantly less comfortable, less safe, and more stressful than at a faster speed then it can be determined that the route is not accessible for all cyclists. 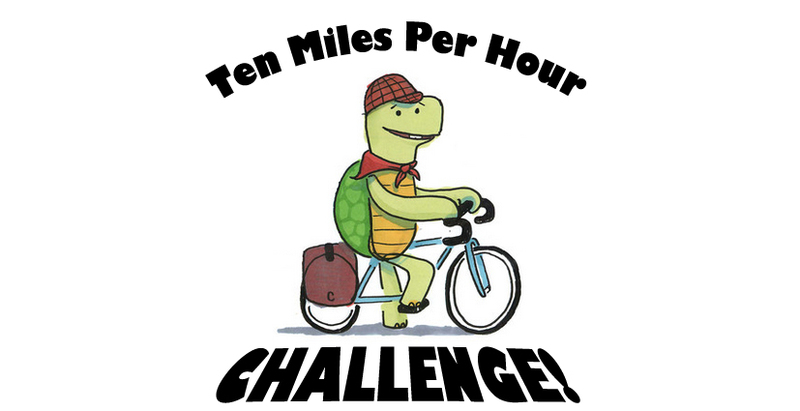 I will start my 10 Miles Per Hour Challenge on Monday, March 3rd, 2014, and continue bicycling throughout the week never exceeding 10 mph. Each day I will write about my experiences, posting pictures and videos. I encourage others to take on this challenge as well, whether it is for a week, a day, or just for a single trip, and then write about it. Keep your bike in the highest/toughest gear at all times. This will affect your speed and balance when starting from a stop or going up hills, simulating a bike rider with low knee strength. Ride your bike in a variety of environments, not just on the routes that seem the safest for low speeds. Think about how drivers react to you differently on different types of streets, as in many communities the only way to get from one place to another is on high-speed arterials. Consider using a mirror as opposed to making shoulder checks behind yourself before changing lanes or merging, to simulate a rider with lower neck/shoulder/back flexibility. Who should take the 10 Miles Per Hour Challenge? Hopefully this experiment will be an eye-opening and enlightening experience for myself, and I hope for anyone else who is interested in trying it as well. Ideally, I want bicycle advocates, traffic engineers, bike education instructors, elected officials - anyone in a position to make decisions about our built environment - to accept this challenge and take away from it a better sense of how to create truly accessible bicycle infrastructure that works for all users, not just the most confident and fit. Perhaps some people will even find that their bike trips are more relaxed and enjoyable when they take it a little easier, and choose to bike slower even beyond this experiment. Hi, I’m Robert Prinz, author of this blog and the Education Director for Bike East Bay, a 4500+ member bicycle advocacy non-profit representing the two counties east of San Francisco. I began teaching bicycle education classes around the East Bay several years ago, and now work to organize classes in multiple languages for participants of all ages and abilities. As part of my work I help to facilitate and implement hundreds of free bicycle education classes every year for thousands of adult, youth, and family participants (more info here), giving people encouragement and the skills they need to make more of their everyday trips by bike. However, despite our best efforts the biggest thing keeping most people from biking more is a lack of safe and enjoyable infrastructure. This means not just painted bike lanes and street signs, but also more progressive concepts such as physically protected bike routes, traffic signals that are oriented and timed for bicyclists, accommodations for making tricky left turns or avoiding common conflicts with car traffic, and so on. These all seem like great concepts which should be no-brainers for implementation, and yet our traffic design standards here in California do not allow them. Beyond that, there are even some well-intentioned bike advocates, traffic engineers, bike skills instructors, and elected officials - people most in a position to do something about these conditions - who don’t seem to think there is anything wrong with the status quo. As an educator I see it as my responsibility to get inside the heads of the people at my classes, to better understand what information or experiences they might need to raise their confidence levels and get them biking, but also to appreciate how their abilities might differ from my own and therefore inform their experience. While I am not the fastest bicyclist I can still put in a lot of miles, having ridden both very long and very steep routes. I don’t speed around town but I can push myself to match traffic speeds in many conditions if the need arises. This is not the experience for many of the people who are already bicycling, and probably not for most of the people who want to bike but don’t for various reasons. If we want to create a system that only serves the most confident and fit users then we are on the right path, but if we truly want to build a bike network that is safe and comfortable for every person who might be riding there (often referred to as an “8 to 80” system) then we have to start with understanding those needs. And that’s what the 10 Miles Per Hour Challenge is about. "Tourtoise" turtle drawing by Sally Carson of Fixpert.com.